As a registered customer you can get notified via e-mail when that product is back in stock. Item is now in your shopping cart! Please enter your question and e-mail and we’ll contact you as soon as possible. It usually takes us up to 24 hours during business days to respond. Thank you, we’ll get in touch! You already sent us a question. This Alternanthera is a well-known stem plant. It is of a deep red colour, and it is often used in Dutch-style planted tanks. There are around 170 known species of the genus Alternanthera. Alternanthera reineckii was first imported into the Netherlands in 1965 under the name of Telenthera osiris. It is considered one of the few species in the genus that can grow entirely submersed. It originates from South America, where it is found along riversides in areas that are periodically flooded during the rainy season. Over five different varietys are cultured. Alternanthera reineckii "Rosa", also sold under the trade names of "Alternanthera rosaefolia" and A. "pink", is a relatively easy cultivar and is the most widespread variety found in trade. A. reineckii "Rosa" may be kept under low light and without additional CO2 fertilisation, however, it will never attain its full potential then. Medium to high light intensities (0.4-1 watt per litre) and fertilisation with CO2 provide it with ideal conditions. In tanks with less intensive light, this plant tends to throw off its lower leaves. The water may be soft to hard, and the pH does not play a significant role either. However, the plant tends to do better in slightly acidic water. 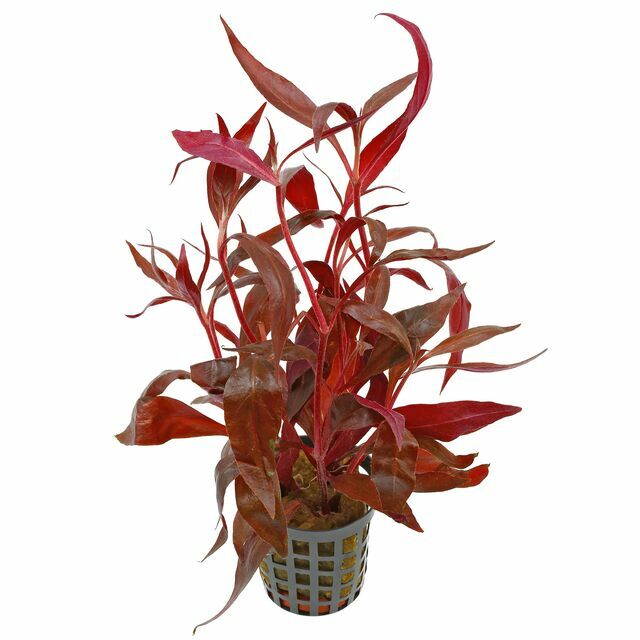 Other than many red-pigmented plants, it prefers a nutrient-rich environment with high levels of nitrate (10mg/l and over) and phosphate (0.5 mg/l and over). In water with a lower nutrient content, fertilisation via the substrate may further the overall health of the plant and its speed of growth considerably. When first planting, make sure you leave a certain distance between the stems. This species is easy to propagate by cuttings, just trimm off the shoot tip and replant into the substrate. On the leftover part of the stem, lateral shoots will soon start to grow, which makes the plant more bushy. 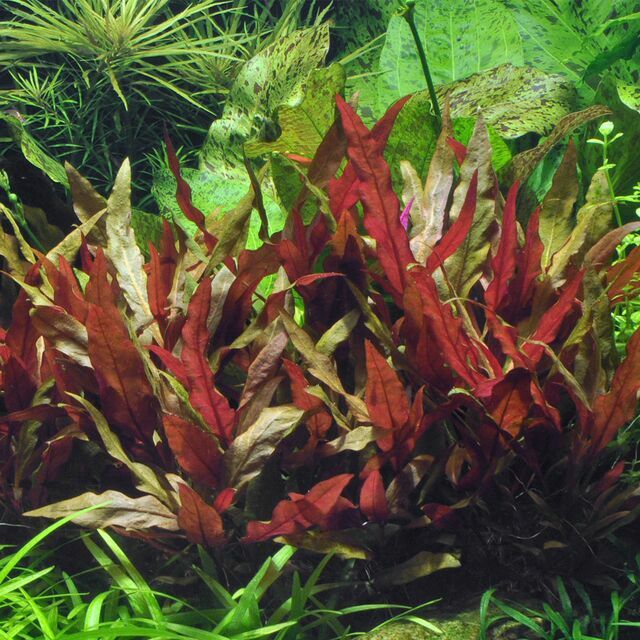 The purple colour of the leaf undersides makes A. reineckii "Rosa" a strong contrast to the manifold green aquatic plant species available in the trade, especially when it is planted in groups. Three to five strong shoots may be used for setting colour accents in the background. In nature aquaria, this plant is not very widely spread. However, in Dutch tanks it is the most popular red plant. Complete botanical name Alternanthéra reinéckii Briq. Please choose a variant to see more information. Der Topf war gut gefüllt und die Pflanze in einem sehr guten Zustand. Bisher wächst sie super an und hat nach einer Woche schon viele erkennbare Wurzeln gebildet. Die Farbe wirkt klasse in meinem sonst sehr grünlastigem Cube. Insgesamt war die Pflanze auch sehr groß gewachsen und ich habe sie ein Stück gekürzt. Bin zufrieden! Trotz einer durch die DHL verzögerten Lieferung von 3 Tagen war die Pflanze in einem sehr guten Zustand und startet bereits fleißig mit dem Wachstum! Растения великолепно выглядят, здоровые , красивые, отлично прижились и растут. Очень бережно были упакованы,без повреждений. как будто только из водоёма! спасибо! All prices stated here include the statutory value added tax (VAT). The costs for the shipping method you have chosen are not included. Crossed-out prices refer to the former price in the Aquasabi shop. All brand names and trade marks are property of their lawful owners and only serve descriptive purposes here. © 2018 Aquasabi | Created with and in Braunschweig, Germany.